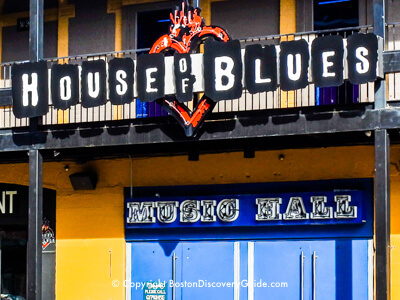 Boston dance clubs are where you'll find DJs, all kinds of dance music - electronic, techno, house, Top 40, salsa, and more - plus the city's most electric nightlife. Most dance clubs in Boston remain fairly empty until 10 or 11pm - and then they fill up until closing time, which is usually at 2am when they have to stop serving drinks. But you'll find exceptions, including one after-hour club offering only dancing. Other dance clubs in Boston have another persona during the day - perhaps as a historic tavern or a popular Boston bar - and then morph into DJ clubs and dance floors late in the evening. 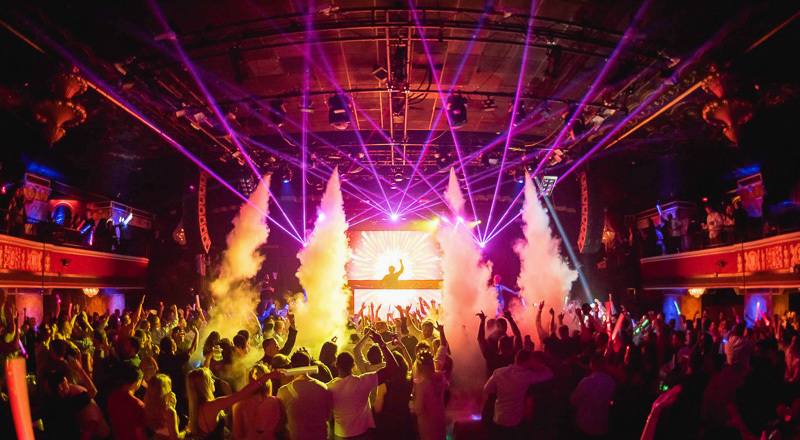 A number of clubs offer "theme" nights, which means the music, the crowd, and the ambiance may differ radically from one night of the week to the next. 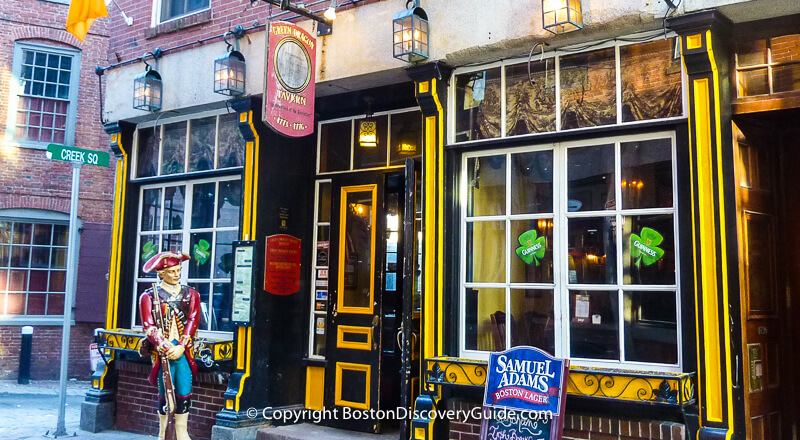 The Green Dragon Tavern dates back to 1654, and from that perspective, it is the oldest historic Boston bar. Of course, the original wasn't exactly in the same location where you'll find it today, although it was nearby. . . the tavern moved around a few times back in the early days. The original building no longer exists, although you can see a small sketch of it on the wall. But no matter. Paul Revere writes in his memoirs about clandestine meetings that he and the other Sons of Liberty - Samuel Adams, John Adams, Dr. Joseph Warren, and others - held here. When they began to worry that the Redcoats were going to march to Concord to look for munitions, this is where they met to organize an eavesdropping operation to overhear British plans. In fact, the Sons of Liberty met here so often that the Green Dragon came to be called the "Headquarters of the American Revolution." Later, in 1788, the Patriots met in this pub to draw up a resolution to support the Federal Constitution. So when you stop by this historic Boston bar for a brew, you truly are following the footsteps of American history. Today, the Green Dragon has taken on more of an Irish flavor, and is warm and welcoming. In case you're wondering if the Green Dragon is now just a tourist trap, capitalizing on its historic past, it's not. It's on a small side street - almost an alley - and despite being almost next to Faneuil Marketplace, lots of tourists don't even realize this slice of history exists. The time of day that you're there also will impact your experience. Late at night, the entire area around Faneuil Hall stretching from TD Garden to Waterfront large crowds due to the many bars, restaurants, dance clubs and other nightlife in the area. Especially on weekends, hoards of college students, young professionals, Boston visitors, and locals are out enjoying themselves. The Green Dragon is rather small and can get noisy once it fills up, especially on nights with live music or comics. For a quieter experience, go earlier in the day - or at least before around 10pm. During the day, sunshine pours in through the large windows, and you'll understand why the Patriots enjoyed hanging out here as they drank and plotted. In addition to the usual bar food, the Green Dragon has a full kitchen and serves good chowder, salads, and sandwiches. The Tavern features bands on most evenings except on Mondays, typically open mic night. Shows start at various times, depending on the day of the week and the act. There's occasionally a small cover charge. 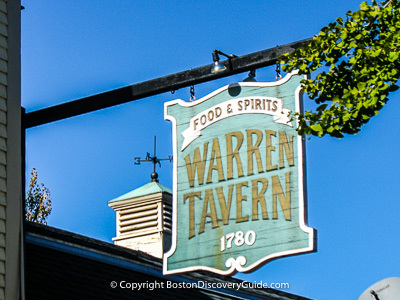 Located in nearby Charlestown, the Warren Tavern claims to be the oldest tavern in Massachusetts and the most famous watering hole in the United States. Among Boston's historic bars and taverns, it is the oldest still in its original building and location. Warren Tavern was the first building to be erected in Charlestown after the British burned the whole town during the Battle of Bunker Hill in June of 1775. The Tavern was built by Captain Eliphelet Newell, who fought at Bunker Hill and had been a close friend of Sons of Liberty leader and fervent Patriot, Dr. Joseph Warren, who was killed by the British at Bunker Hill. Captain Newell named his tavern after his friend. Paul Revere had also been a good friend of Dr. Warren, and he and other Patriots frequently met at the Warren Tavern for a few brews. Revere often remarked that it was one of his favorite watering holes. General George Washington also stopped by for "refreshments" while visiting a friend in Charlestown. On the outside, the Warren Tavern is a plain Federal-style building. Inside, the low beamed ceilings and the large fireplace make you feel as though you're stepping back into history - and in fact, you are. Warren Tavern is one of the most historic Boston bars, even down to the beams in the ceilings, which the builders salvaged from old boats at nearby Charlestown Navy Yard - making the beams even older than the rest of the Tavern. 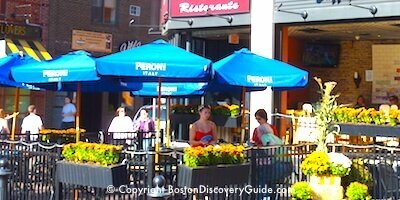 Even though the Warren Tavern is close to the Charlestown part of the Freedom Trail and not far from Bunker Hill, you'll usually see mostly locals and professionals who work nearby, with perhaps just a table or two of Boston visitors soaking up the historic ambiance. This is a place where you literally might be sitting in the same spot where Paul Revere and George Washington sat 200+ years ago. Of course, unlike current patrons, they didn't get to enjoy sports on the flat-screen TVs at the bar. Warren Tavern serves brunch, lunch, and dinner. Aside from breakfast-type items (available until mid-afternoon), lunch and dinner menus include soups, salads, sandwiches, burgers, and a few entrees. Go for the lobster roll, fish and chips, shepherd's pie, or steak tips. Bell in Hand was built in 1795 and is America's oldest continuously operating tavern (not counting Prohibition, which shut down every legitimate bar in the U.S.). 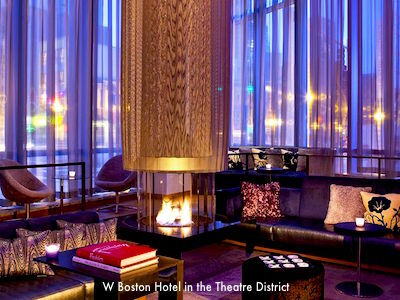 It's located around the corner from the Green Dragon, in Boston's historic downtown. However, this is a place where 21st century fun definitely takes center stage over history. In fact, if you want to get a sense of being one of the most historic Boston bars, go early in the day because once the music starts, you won't be thinking about Founding Fathers or Founding Mothers. Jimmy Wilson, Boston's last Town Crier, built Bell in Hand after he retired from shouting out the town's news - and of course, "Bell in Hand" refers to the bell that he used to carry around while on the job. He reported on all the big events of his time - the Boston Tea Party, the Declaration of Independence, the Battle of Bunker Hill, the Defeat of the British. Bell in Hand has occupied its current very attractive building since 1844. Its first spot was roughly where Boston City Hall is located today. You can see one of the original signs with a hand holding a bell in Boston's Old City Hall, near the Benjamin Franklin Statue on the Freedom Trail. 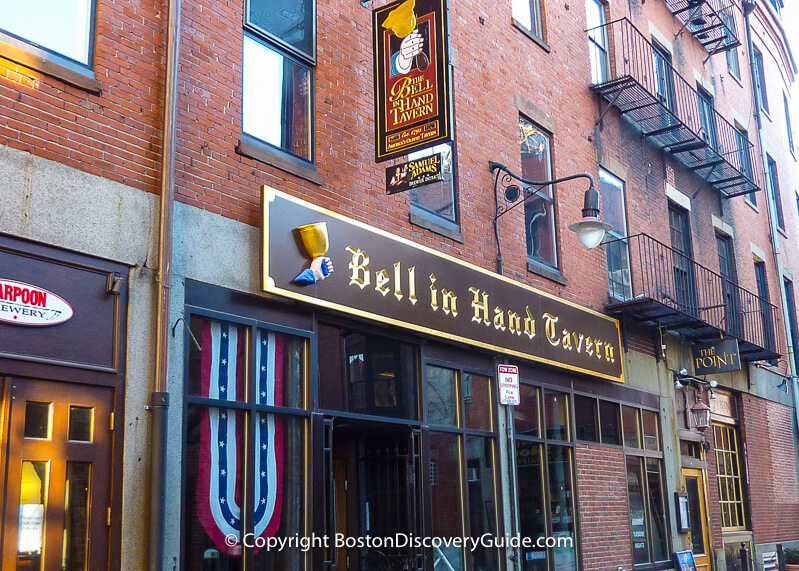 Early Bell in Hand patrons included Daniel Webster and Paul Revere (who, incidentally, seems to have frequented every Boston bar for miles around during his long lifetime). But . . . if you're imagining that they were quaffing down pints of ale, not so. Jimmy Wilson didn't believe in "hard stuff" (no doubt he'd seen more than his share of alcohol-fueled street brawls such as the one that led to the Boston Massacre during his Town Crier stint), so the Bell in Hand served only Smith's Philadelphia Cream Ale until 1919. Those days are long past. Bell in Hand features live music plus DJs every night of the week. Tuesdays spotlight karaoke music. You can even try some trivia on Mondays. With 2 floors, 5 bars, and large plasma TVs, Bell in Hand is one of the hottest nightspots in the Faneuil Hall area. Expect to pay a cover charge on after a certain point on most nights, when this historic bar morphs into a popular Boston dance club that attracts lots of college students and a mostly 21-to-30-something crowd. Bell in Hand also offers full restaurant service for lunch and dinner. If you want to experience the historical ambiance rather than the dance vibes, come for the pub food favorites at lunch, afternoon drinks and appetizers, or dinner. In the "who's the oldest" competition, the Union Oyster House's claim to fame is being the oldest restaurant in Boston and the oldest restaurant in continuous service in the U.S. It occupies a building dating back to pre-revolutionary days, and has been serving customers since 1826. Union Oyster House's dining rooms have changed little during the past 200 years (aside from now having electric lights), and give you a real sense of history and post-Colonial decor. 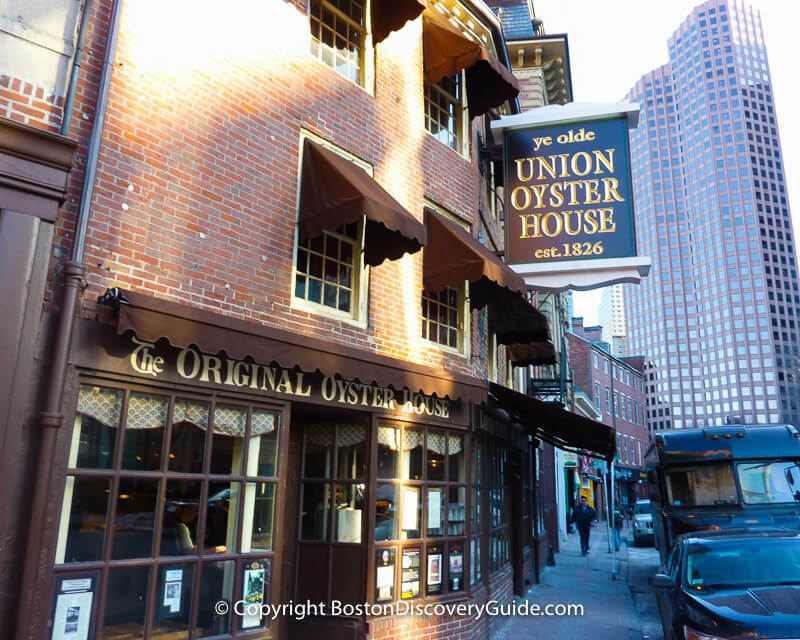 Unlike other historic Boston bars known best for their beverages, Union Oyster House is known best for its oyster bar and perfectly cooked fresh seafood. The cozy Colonial-period dining rooms, whole steamed lobsters, New England shore dinner, and seafood pie can't be beat. Interested in going on a Historic Boston Pub Crawl? For some Boston visitors, this is the ultimate Boston tourism adventure - a memorable evening of absorbing a little history and having a lot of fun. 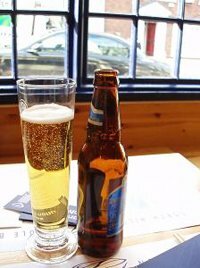 Although you'll see commercially offered Boston Pub Crawl Tours, you can easily do this tour on your own, since 3 of the 4 of Boston's historic bars are within a couple of blocks of each other. 1. Start your evening at Union Oyster House around 7pm (reservations are a good idea). Wash down a half dozen oysters with beer, crisp white wine, or other beverage of your choice. Still hungry? Have a cup of the fabulous fish chowder. 2. Go next door to Bell in Hand. It's probably about 8:30 by now. Order the beverage of your choice and a burger. Now it's about 10pm. Check out the DJs and the music. The bar's getting crowded and much louder. Stay as long as your ears can stand it. 3. Walk around the corner to the Green Dragon Tavern. Appreciate the relative quiet. Order one more drink and a steak, medium rare. Listen to the music for awhile longer, and then head back to your hotel. Appreciate the compact size of Boston's historic downtown core. Wonder why the Puritans couldn't have laid out straighter streets.